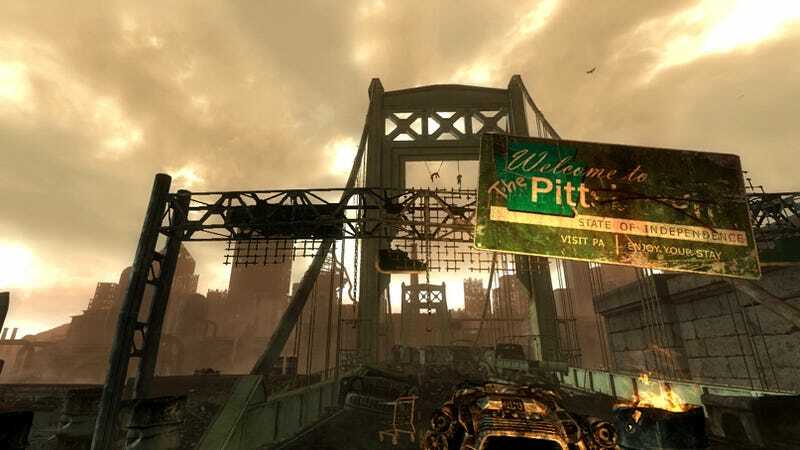 Bethesda formally welcomes you to post-apocalyptic Pittsburgh, PA, with three new screenshots from the upcoming Fallout 3 add-on The Pitt. Did somebody say auto-axe? The Pitt content opens with the players responding to a desperate radio message. Someone in The Pitt has created a cure for mutations, and the player must travel there and retrieve it from the leader of the settlement at all costs. From there the choice on how to proceed is up to the you. Do you side with the slaves of The Pitt or their raider overlords? How about just going in with your rotary auto-axe blazing? Find and use new weaponry, such as the AutoAxe, a new melee weapon with a powerful, serrated rotary blade hungry for flesh. A multi-bladed axe that spins? Hell, that's worth the 800 Microsoft points alone! Look for The Pitt to drop next month on the Xbox 360 and PC. For now, behold the glory of the auto-axe.